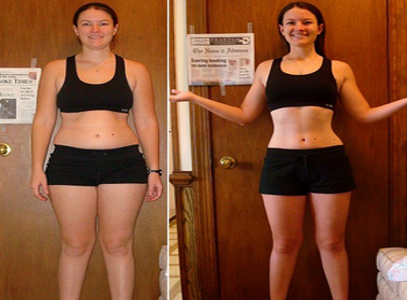 6 Minutes to Skinny is an unique fat loss program that uses the body’s natural cycles to give you fast, safe, natural weight loss. All you have to do is do a series of simple and fast movements (exercises) and prepare a metabolic cycle meal and from start to finish, it will only take you six minutes. They say that you will feel full and burn 450% more fat during the day. They also claim that that they have seen people lose up to 10 pounds in the first 10 days with this so you know I was excited to actually get it and and see what it was about. 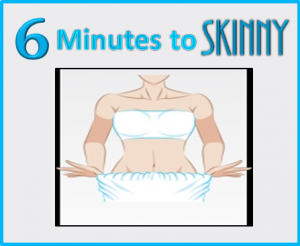 How Does 6 Minutes to Skinny Work? 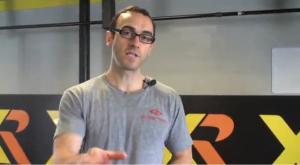 Craig Ballantyne, CTT is a well-known fitness expert and the creator of 6 Minutes to Skinny. According to Craig and 6 Minutes to Skinny, when you follow the instructions for food and movement that takes just six minutes, what happens is it leads to biochemical and hormonal changes in your body and these changes are all-natural changes. When you start completing your first metabolic cycle correctly, your body will adapt to start burning fat for energy. They call “metabolic cycling” synchronizing your food and movement with your body’s natural cycle so that you get better results from much less effort. Craig explains that metabolic cycling consists of a series of unusual yet extremely effective food and movement strategies that are the key to tapping into your body’s natural fat burning cycles to give you fast and permanent weight loss. Craig is confident that 6 Minutes to Skinny will work for you if you have terrible genetics, a terrible metabolism, a thyroid condition, and if you tried everything and nothing’s worked for you. It’s called 6 Minutes to Skinny because the program is based on a simple six minute morning routine that sets your body up to burn fat all day long. Your body goes through various metabolic cycles and the first cycle happens when you wake up in the morning; so that’s the most important cycle for those people who want to lose weight and reshape their body. That’s when you do the 6 Minutes to Skinny routine – first thing in the morning. They say that this routine boosts specific enzymes in your body and those enzymes tell your body to start burning fat for fuel. Great for people who don't like working out and/or don't want to spend 30 minutes to an hour exercising everyday but still want results! For those who get easily bored, the system is also designed to do completely different movement patterns each morning and to start your day off with a healthy shake made with protein and other nutrients. They advise that you do this morning cycle at least 4 times per week and they recommend sticking to Monday, Tuesday, Thursday and Friday and then taking Wednesday, Saturday, and Sunday off from the 4-minute workout and instead stay active doing something you enjoy like walking. These are suggestions to get you started and but they add that after you get in the habit of doing your 6-minute food and movement pattern in the morning, then you can accelerate your results by doing longer exercise videos. You can use the nutrition book that they give you as well for your lunch and dinner meals and they say that you will see even faster results. Many 6 Minutes to Skinny Reviews tell you want you get in the program, but I’m going to show you exactly what you get in the 6MTS System. Check out my 6 Minutes to Skinny Sneak Peak video below. What Do I Get With 6 Minutes to Skinny? The 27 page e-book is printed in a nice large font and has a nice amount of spacing so it’s easy to read. 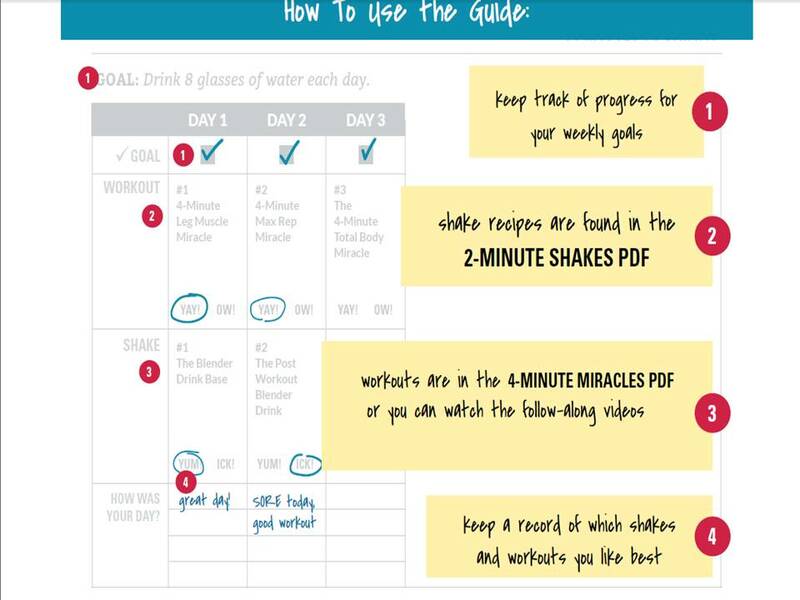 The pdf e-book guide gives an overview of 6MTS and provides an 8-week guide that you use to mark your progress and your weekly goals. This is very helpful. I’m a person that needs check marks and lists and that’s kind of how I operate. It helps me to stay on track. I think that’s a great thing that they’ve incorporated this daily/weekly chart and you can print it out and use that on a weekly basis to make sure that you are following the system as you’re supposed to. 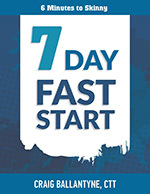 The 7-day Fast Start guide is a short book to help you get started the right way – to get hit the ground running for your first seven days. They tell you in the book that you are free to substitute different smoothies and workouts from your other guides so you don’t have to do those that are in the guide, but that probably would be the best thing to do so that you exercise your entire body. The most important point is to make sure that you drink your smoothie and do your exercise daily in the morning. This is the same 8 Week Guide that is in the main pdf. You use it to mark your progress and your weekly goals. They give you a goal for each week like “eliminate soft drinks from your diet”, “drink eight glasses of water”, “take small bites chew more and set down your fork between bites”, “journal your thoughts and schedule the next day”, “focus on getting eight hours of sleep every night”. What I like about this is that every day you have a different four minute exercise to do. All you have to do is look at your calendar: Day 1 – do this exercise when you wake up, make this particular shake. They give you the number and the name of the shake and then you just refer to your shake recipe book and make and enjoy. I like that I can check it off at the end of the day and write down how my day was; it’s really simple to stay on track and you can post this on your wall or put it in your diary. 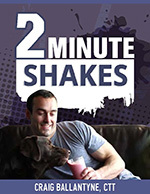 The shake recipes are found in the 2 Minute Shakes pdf. There are 43 blender shake recipes – more than enough variety to keep you satisfied. In two minutes or less you have a great tasting nutritionally packed shake that will burn fat and help you power through your day. Make a note of which shake you’re doing and whether you like it or not. At the end of the book is a frequently asked questions section where many questions are answered about smoothies, nutrition and calories and more; so that’s really helpful because you might have a question that may be answered in the back. 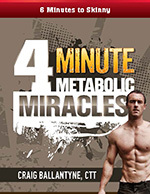 Then there’s the 4 Minute Metabolic Miracles guide that walks you through your new workout program. It starts off by giving you 10 tips to train. You’ll find short fat burning workouts that can be performed almost anywhere. It has pictures of the actual movements and a description of how to actually do that exercise. You can watch and follow along with the videos that are in the members area (which are also downloadable). So you can use this in conjunction with the videos and you should have all the information you need in order to do the exercises properly. They also advise you to keep a record of which workouts you like best. 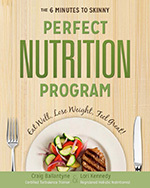 You also get a 43-page book called Perfect Nutrition Program. The morning shakes are essential for burning fat, but then what about the other meals of the day? That’s where the Perfect Nutrition Program comes in. This guide covers what you should eat for fat loss, how to save money on healthy foods, awesome ways to eat while traveling, and they give you some lunch and dinner ideas. Craig gives you some healthy dessert options, stop snacking rituals (things that you can do to stop snacking), a supplement stack and his daily fat loss diet checklist of what of what he eats and what he takes throughout the day. He also talks about taking a baby-step approach to eliminating bad foods from your diet. We all have things that we shouldn’t eat but we loved to eat them. Instead of just going cold turkey on things, you take baby steps and eliminate these things from your diet and replace them with healthier options and create healthy habits. This book is filled with a lot of good useful information to help you in your fat loss journey. To fully disclose, Craig did give me a free copy of 6 Minutes to Skinny to try out and I do receive a commission if a purchase is made through my affiliate link (but it doesn’t cost you any more). Thank you (so much!) in advance if you do go through my link, and please keep reading to learn about the Free Gift Bonuses that you can only get through Fat Crushers. The 6MTS program is not the same thing every day so for people who need variety you’re going to get that variety in your workouts and with your morning shakes. The ebooks have large print and are easy to read. It’s a quick and simple to do routine that’s perfect for women who don’t have a lot of extra time but want to lose the fat and reshape their body. The videos are very good quality and you feel like you have your very own personal trainer encouraging you through your 4 minute workout. The 4-minute movement videos are accessible in the members area and are also downloadable. One guide says to train for 4 days a week then rest for 3; but the 8-week calendar actually shows 5 days per week that you train and off for 2 days. This conflict in the instruction can be confusing. There are 2 completely different week 1 charts that caused a bit of confusion for me. One is in the 8-week guide and the second is a part of the 7-day Fast Start guide. It makes no sense to have two week 1 charts. They have different exercises for the week and different shake recipes, so I was wondering why they would do that and which one is better for the first week! It just causes unnecessary confusion. There’s no clarity on when we do the morning exercises. They just say “when you wake up”. Well does that mean literally when I wake up, or do I have a window? Can I do the exercises 15 minutes after I wake or up to an hour after I wake? This should be made clearer. There are no recipes for meals. You get lots of smoothie recipes, but what about healthy meals for the rest of the day? Don’t worry, if you decide to buy through my link, I’ll give you a free gift that includes a healthy meal recipe book! This may not be a good program for people with a limited range of movement. The 4-minute workouts are intense and you need to be physically able to do the movements that may range from going from a floor position (pushups for example) to a standing position and back again to the floor position. I highly recommend the 6 Minutes to Skinny program for anyone who wants to lose the fat in a healthy manner and does not want to spend 30 minutes to an hour working out everyday. I think this is perfect for those who don’t like to workout but know that they need to get daily exercise to stay fit and healthy. The 4 minute workouts are intense but they go quickly and you will feel a huge sense of accomplishment when you’re done – at least I know I do. 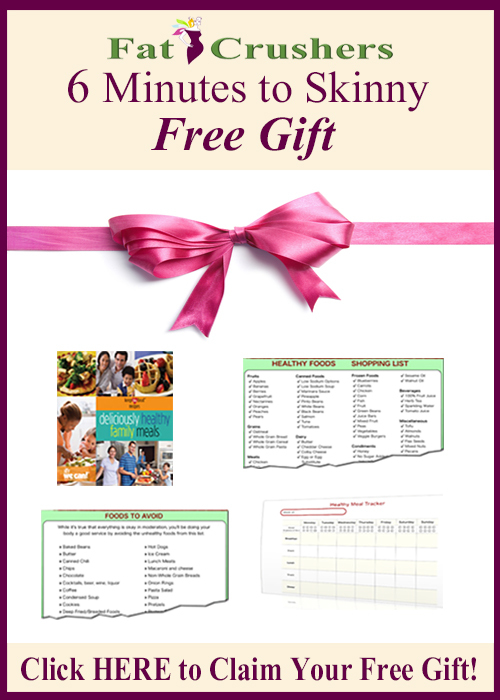 I always try to give a little something extra to those who purchase through my affiliate links, so as a thank you, I’m happy to offer the Fat Crushers’ 6 Minutes to Skinny Free Gift, which is a Set of Tools and resources that you can use to help manage your weight loss goals. 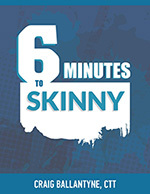 Again, if you have questions or want to learn a bit more about 6 Minutes to Skinny, I encourage you to check out the sales page by clicking here.